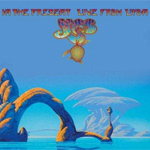 Perhaps one of the most seminal UK progressive rock bands is the legendary and iconic Yes. Following the release of their first studio album in 10 years, Fly From Here, the band gives us a live performance, In the Present, recorded in Lyon France in December 2009. The package includes 2 CDs and a DVD, which offers some excerpts from the live show, interviews, and other behind the scenes goodies. Purists can also secure the live set on vinyl in a three platter gate-fold edition. This performance features Canadian Benoit David (Mystery) substituting for Jon Anderson. Fans can quibble about his performance and similarities to Anderson to their heart's content. On In the Present he does a more than adequate job. Additionally, this recording is before the band went into the studio with Benoit for Fly From Here. So, in a sense, this live show is closer to a 'greatest hits' set as many of those classic Yes songs are here. Regarding the live performance, my initial reaction at the start, with Siberian Khatru, was that the band sounded flat or, maybe better, stolid. Then the iconic I've Seen All Good People arrives and I felt Yes seemed off, not quite flowing together. The second CD opens with Owner of a Lonely Heart which also felt flat, lacking the energy and enthusiasm that made it such a big hit. Conversely, midstream to the aforementioned I've Seen All Good People, Yes seems enlivened and purposeful. Thankfully, those characteristics, rather than the latter, infuse the greater percentage of songs here. Most notable are Onward, Tempus Fugit, and classics Yours Is No Disgrace, Roundabout, and Starship Trooper. While perhaps a bit uneven in performance, Yes' In the Present is certainly representative of the band in its current form and time. Perhaps what would have made this package even better would be the full concert on DVD. Otherwise, Yes fans should not be disappointed. While perhaps a bit uneven in performance, Yes' In the Present is certainly representative of the band in its current form and time. Fans should not be disappointed.